Condition or proportion of poor in a population. Although the riches of the Jews have passed into a proverb, all social observers are agreed that the Jews have a larger proportion of poor than any of the European nations among whom they dwell. 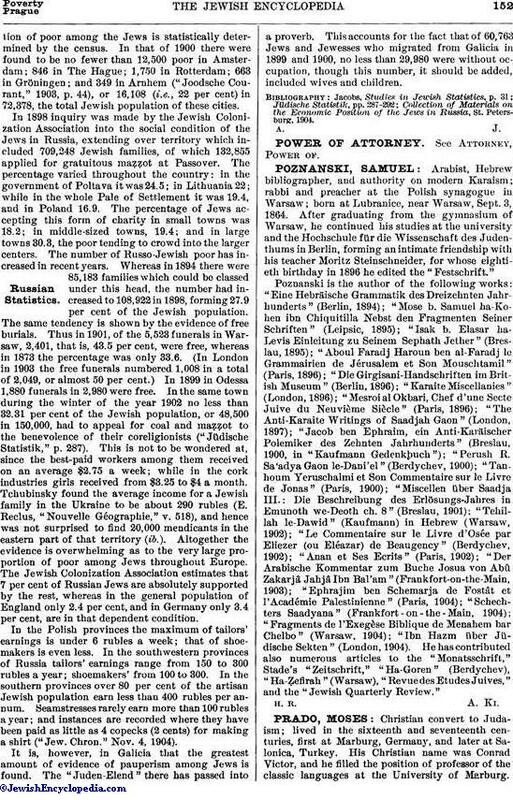 In 1861 the number of poor, i.e., totally dependent, among the adult workers of the Jewish population of Prussia was 6.46 per cent, as against 4.19 per cent in the general population. On the other hand, there were among the Jews of Italy in 1871 only .09 per cent who were technically paupers, as compared with 2.2 per cent in the general population. In 1871 in Budapest 24.2 per cent of the 21,071 adult Jewish workers were classified as among the poor, while in 1883 there were in London no less than 11,099 in 47,000, or 23 per cent, who accepted some form of charity (Jacobs, "Studies in Jewish Statistics," p. 12). In 1869 Jeitteles estimated that 43 per cent of the Jewish population of Vienna lived in two rooms or less. In Holland the proportionof poor among the Jews is statistically determined by the census. In that of 1900 there were found to be no fewer than 12,500 poor in Amsterdam; 846 in The Hague; 1,750 in Rotterdam; 663 in Gröningen; and 349 in Arnhem ("Joodsche Courant," 1903, p. 44), or 16,108 (i.e., 22 per cent) in 72,378, the total Jewish population of these cities. In 1898 inquiry was made by the Jewish Colonization Association into the social condition of the Jews in Russia, extending over territory which included 709,248 Jewish families, of which 132,855 applied for gratuitous maẓẓot at Passover. The percentage varied throughout the country: in the government of Poltava it was 24.5; in Lithuania 22; while in the whole Pale of Settlement it was 19.4, and in Poland 16.9. The percentage of Jews accepting this form of charity in small towns was 18.2; in middle-sized towns, 19.4; and in large towns 30.3, the poor tending to crowd into the larger centers. The number of Russo-Jewish poor has increased in recent years. Whereas in 1894 there were 85,183 families which could be classed under this head, the number had increased to 108,922 in 1898, forming 27.9 per cent of the Jewish population. The same tendency is shown by the evidence of free burials. Thus in 1901, of the 5,523 funerals in Warsaw, 2,401, that is, 43.5 per cent, were free, whereas in 1873 the percentage was only 33.6. (In London in 1903 the free funerals numbered 1,008 in a total of 2,049, or almost 50 per cent.) In 1899 in Odessa 1,880 funerals in 2,980 were free. In the same town during the winter of the year 1902 no less than 32.31 per cent of the Jewish population, or 48,500 in 150,000, had to appeal for coal and maẓẓot to the benevolence of their coreligionists ("Jüdische Statistik," p. 287). This is not to be wondered at, since the best-paid workers among them received on an average $2.75 a week; while in the cork industries girls received from $3.25 to $4 a month. 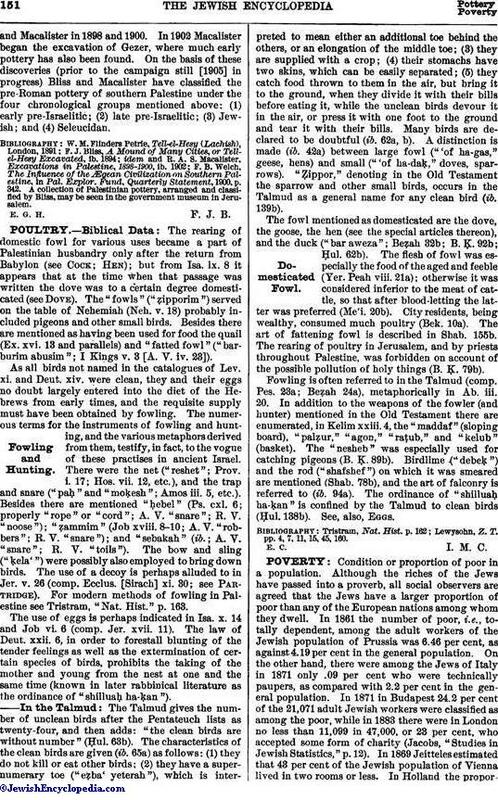 Tchubinsky found the average income for a Jewish family in the Ukraine to be about 290 rubles (E. Reclus, "Nouvelle Géographie," v. 518), and hence was not surprised to find 20,000 mendicants in the eastern part of that territory (ib.). Altogether the evidence is overwhelming as to the very large proportion of poor among Jews throughout Europe. The Jewish Colonization Association estimates that 7 per cent of Russian Jews are absolutely supported by the rest, whereas in the general population of England only 2.4 per cent, and in Germany only 3.4 per cent, are in that dependent condition. In the Polish provinces the maximum of tailors' earnings is under 6 rubles a week; that of shoe-makers is even less. In the southwestern provinces of Russia tailors' earnings range from 150 to 300 rubles a year; shoemakers' from 100 to 300. In the southern provinces over 80 per cent of the artisan Jewish population earn less than 400 rubles per annum. Seamstresses rarely earn more than 100 rubles a year; and instances are recorded where they have been paid as little as 4 copecks (2 cents) for making a shirt ("Jew. Chron." Nov. 4, 1904). It is, however, in Galicia that the greatest amount of evidence of pauperism among Jews is found. The "Juden-Elend" there has passed into a proverb. This accounts for the fact that of 60,763 Jews and Jewesses who migrated from Galicia in 1899 and 1900, no less than 29,980 were without occupation, though this number, it should be added, included wives and children. Collection of Materials on the Economic Position of the Jews in Russia, St. Petersburg, 1904.